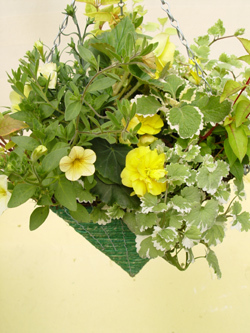 View some of our Hanging Basket Recipes and be inspired at what can be done. All baskets and plants viewed in these recipes can be purchased from this website. Surround your White Showcase Geranium with the beautiful variegated yellow and gold leaves of the Fuchsia Anna Silveria, Barbara Norton and Genii. This basket gives a medley of lemon, yellow, cream and white flowering plants, simply combine Lemon and Trailing Ice Million Bells, Victorian Yellow Surfinia and Sunray Cascading Petunia in vibrant yellow with the stunning Non-Stop Flowering Begonias in Go Go Yellow. Begonias bloom all summer long and if you add extra large summer flowering vibrant yellow pansies, and for good measure compliment with Dianthus in soft lemon, you will have blooms that will put on a long lasting cheerful show. Compliment your limes and yellows with attractive foliage plants, Mint Cream Plectranthus, Helichrysum Limelight or Gold and Nepeta. 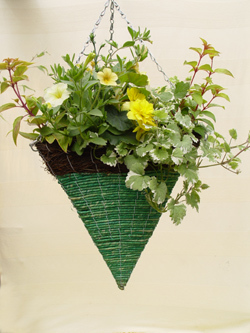 This combination with a tangy lime green hanging basket triangular cone looks especially pleasing as the trailing light coloured leaves contrast well against the basket base. This basket is just summer sunshine - full on.